First, to make a clear broth, put the bones in a pot, cover them with cold water, bring to boil, then pour out, wash the bones and repeat this once more – this time add oxtail to the bones. If dark foam appears on the surface as before, repeat the procedure one more time, otherwise turn down the flame a little and pick up the light foam. Second, halve the ginger lengthwise and pound it with a beater. Along with other spices and the onion, roast them in a pan until the onion turn dark brown. Once you pick up all the foam from the broth, add the roasted spices, 2 teaspoons of salt, depending on the variant of pho also beef shin, turn down the flame and boil the broth for 5-6 hours (if the water evaporates, pour in some more). Cook the beef shin depending on its size for 2-3 hours, then remove from boil and let it cool down. In the end add more salt or fish sauce according to one’s own taste. All you prepare just before you serve the soup! 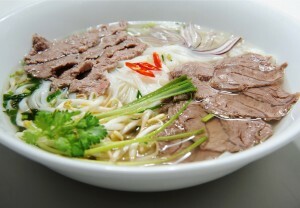 Pho is served in a deep bowl, along with herbs, meat and noodles it is considered as a main meal. First, rinse the herbs well. Perilla is eaten with the stem, just break off the woody part (like asparagus). Cut the cooked beef shin or raw false sirloin (rump or shoulder) into thin slices. Prepare mung sprouts, coriander and green perilla on a plate. On another plate put lemon and chopped chili peppers. Soak the noodles in cold water for one hour. Then cook them for a short time (30 seconds) in boiled water through a sifter. Immediately divide the noodles into the bowls. Spread the meat above the noodles and add the chopped coriander, spring onion and sliced red onion. Finally pour everything with the hot broth and serve immediately.